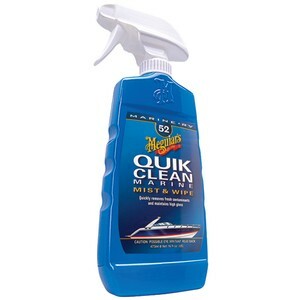 Meguiars Quik Clean Marine is an easy to use spray and wipe product that quickly removes fresh contaminants without the hassle of washing the entire boat. Meguiar's Quik Clean Marine is an easy to use spray and wipe product that quickly removes fresh contaminants such as water spots, sea spray, bird droppings, gasoline, etc. without the hassle of washing the entire boat. Cleans without scratching while leaving a glossy finish making it perfect for use after a day on the water, or between regular washing. This is one of our favorite regular use maintenance items that will help keep your boat looking great between full washes, without hurting the layers of protective wax you've built up. Add it to your daily routine with a microfiber towel and see how easy it can be to keep your boat looking great.